Valentine’s day is quickly approaching! Have you made plans with your special someone? May I suggest this spectacular dessert! 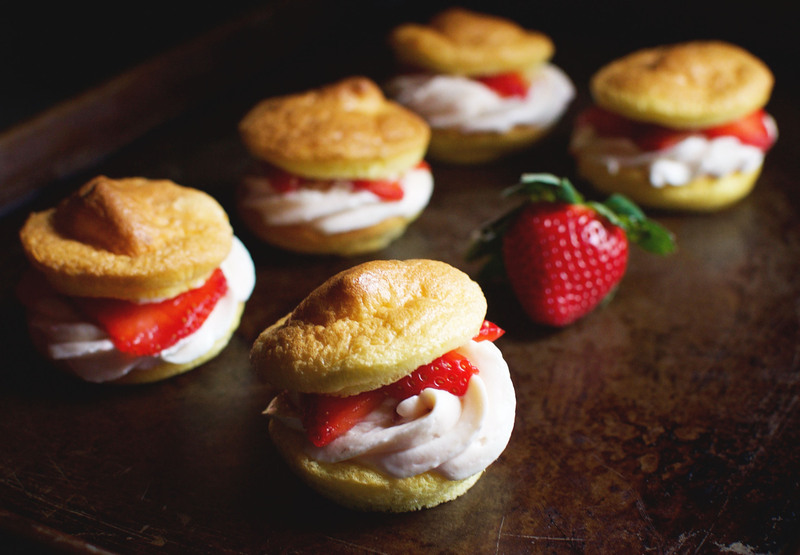 These Low-Carb Strawberry Cream Puffs will make your Valentine swoon. 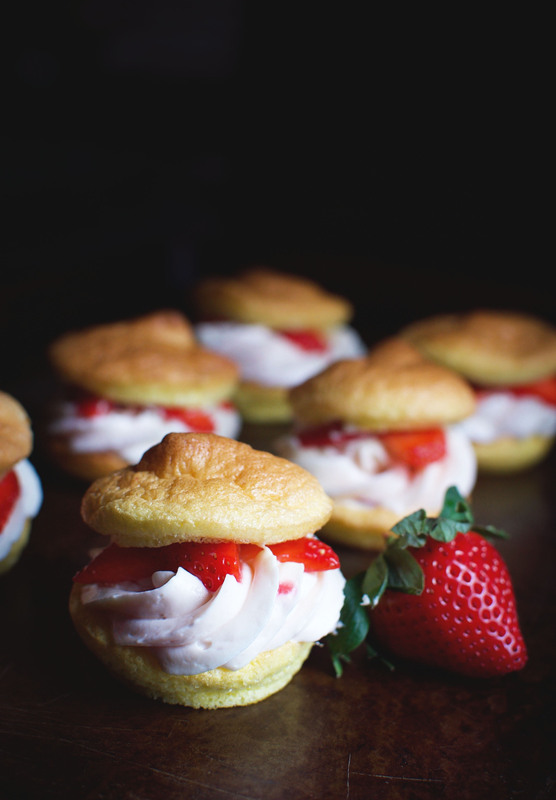 Velvety, strawberry-scented cream is sandwiched between delicate vanilla flavored puffs. The golden color of the pastry looks beautiful with the light pink filling. Add a strawberry to garnish and you have a dessert even cupid would be proud of. The puffs in this recipe are similar to cloud bread. I don’t know where this bread started or who made it first, but what I do know is that it’s delicious! Cloud bread is made from cream cheese and eggs. The eggs are separated and the whites are beat into meringue. The yolks and cream cheese are blended together, then the meringue is folded in. When it’s baked, this concoction turns into a light, delicious and cloud-like bread–hence the name. We have found that sweetened-up cloud bread makes a heavenly base for desserts. There are a few tips to making cloud bread. First of all, be sure all ingredients are at room temperature. By room temperature, I mean they need to sit out at least half an hour or more to give them time to actually become room temperature. Don’t try to shave off time and make the bread after they’ve been out of the fridge for only ten minutes. You will end up with yolks with globs of white stuff floating in them. Yep, I’m guilty! If this does happen to you, don’t worry, just let the mixture warm up a little more and beat it again. Another advantage of having the egg whites at room temperature is that warmer egg whites form meringue faster and easier. This brings me to my second bit of advice for this recipe. Make sure any bowls or beaters you use with the egg whites are impeccably clean. I suggest using a metal bowl because it’s easier to get clean. Grease loves to stick to plastic and any bit of grease will keep the meringue from forming. Speaking of grease, egg yolks contain lots of fat, so you need to separate the eggs cleanly. Even a tiny bit of yolk will ruin the meringue. I suggest separating each egg into a separate container before adding the white to the other whites. This way, if yolk contaminates one white, it only ruins the one white, not the whole batch. If you do get a bit of in one of the whites, no worries, just put it in an air-tight container use if for another purpose. While these little pastries make a perfect Valentine’s treat, they can add a sweet ending to any meal. Don’t have a Valentine? Lucky you! That means you don’t need to share. Enjoy! 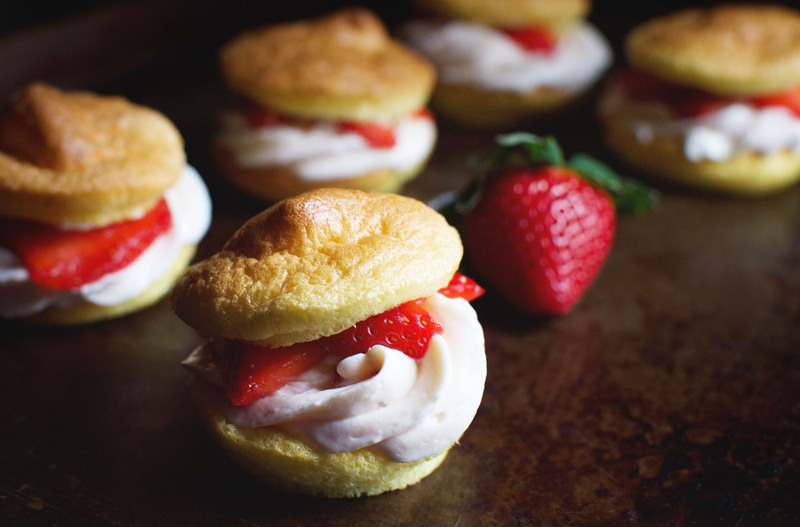 These Low-Carb Strawberry Cream Puffs make a dreamy dessert. This dessert can be part of a ketogenic, low-carb, Atkins, LC/HF, gluten-free, or Banting diet. with coconut oil or other oil of choice. In a very clean, medium bowl. Using a hand mixer, beat together egg whites and cream of tartar until egg whites are stiff. Set aside. In a separate bowl, beat together cream cheese and sweetener. Add egg yolks, one by one, beating after each addition and scraping down the sides of the bowl occasionally. Mix in vanilla extract. Add about 1/3 of the egg whites to the cream cheese mixture and fold in to lighten. Fold in the remaining egg whites, being careful to not deflate the meringue. Spoon the mixture into the muffin pans, until they are about half full and the mixture is evenly divided among all cups. Bake for 27-33 minutes or until golden brown. When cool enough to touch, remove puffs from pans and place on cooling rack to cool completely. In a medium bowl, beat together cream cheese, butter, and sweetener until smooth. Mix in vanilla extract. In a separate, small bowl, beat the cream until soft peaks form. Gently fold cream into the cream cheese and butter mixture. Fold in strawberries. Pipe or spoon strawberry cream onto 12 of the puffs and top with the other 12 puffs. If desired, garnish with additional strawberry slices. These looks so yummy and so cute! This is such a great idea for Valentines day! And for any other day for that matter. Omg these look amazing!! I’ll have to make these for VDay for sure! I try to avoid sweets all together. However, if you are looking for a dessert as a low carver, these would be fantastic. Love the idea. These cream puffs are the perfect dessert! are thrilled to have them. This time I am making two batches, strawberry and blueberry. Thanks so much! I’m glad even your guests are enjoying them! I’m not sure exactly what you mean. I assume you want to make a chocolate filling instead of a strawberry filling. You may consider using the filling recipe for our Low Carb Triple Chocolate Snack Cakes instead. Have fun! Have you ever frozen the base and then thawed before adding the filling and serving? Sorry, Tamara, I haven’t. I think they would freeze okay, but I’m not really sure. Hello! Are these something that have to be made day-of? Or can I make them the night before and refrigerate them? You can make them ahead and refrigerate them. Just keep them in an airtight container.